DivcoWest, founded in 1993, is a privately owned real estate investment firm with offices in San Francisco and Boston. The company has acquired more than 30 million square feet of commercial space throughout the United States. DivcoWest and its affiliates are currently managing over $2.5 billion of equity. Presently under management are both commercial and residential assets, including the underlying debt. Construction is underway for the next two buildings at Cambridge Crossing on Parcels G & H. The new office/lab buildings will contain a total of around 900,000 square feet, all of which has been leased to Sanofi. Sanofi plans to bring 2,700 workers to the "wired" neighborhood when construction of their new space is complete in 2021. Construction continues on 250 North Street in Cambridge Crossing the future home of Phillips Headquarters. Phillips has leased 243,000 square feet of the 430,000 complex. The state of the art facility has already received a Platinum level Wired Certification. The entire Cambridge Crossing development will, in fact, be designed for a full neighboorhood Wired Certification. This certification denotes the highest level of connectivity and when complete will only be the second neighborhood in the U.S. to receive this designation. Construction on 250 North is scheduled to be complete in the first quarter of 2020. Exterior work is ongoing at 250 North Street in Cambridge Crossing. The upcoming 430,000 sf office and lab space will be home to Philips North American Headquarters. Tina Snyder, Director of Marketing at DivcoWest, told BLDUP the construction team expects the building to be complete in the fourth quarter of 2019. While construction is ongoing the development team is working to integrate Cambridge Crossing into the surrounding community through events at the site, including the CX Summer Nights series that wraps up this week. Callahan Construction Managers has completed construction on Phase II of AVA North Point in Cambridge. The 265 total unit luxury buildings (2), developed by AvalonBay Communities, features a mix of studio, one, two, and three bedroom residences. Resident amenities include a 24hr fitness center, gaming lounge, pool, elevated courtyard, pet spa, and a bike workshop with a unique DIY space. The distinct apartments exterior was designed by Kyu Sung Woo Architects Inc. with CUBE 3 Studio designing the interior units. Most feature sliding barn doors, gear walls, utility charging stations, and chalkboard walls. In addition, the apartments include stainless steel appliances, granite countertops, in-unit laundry, and are designed for LEED Silver sustainability. Callahan's work on the six-story, wood framed building also includes 3,000 square-feet of retail space on the ground floor and three levels of underground parking. AVA North Point is ideally situated less than a 5 minute walk from the Lechmere MBTA station and just one mile from Boston. 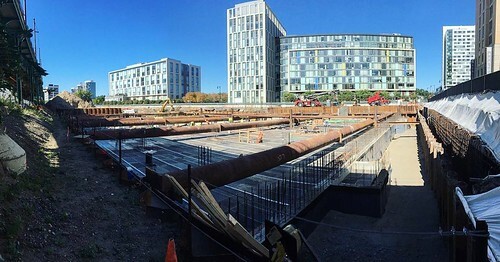 The future home of Philips North America in Cambridge, MA has topped off. The new headquarters for the company will relocated 2,000 employees from their current facilities in Andover. The move is an attempt to help Philips broaden their business to also include the health technology sector. Cambridge Crossing is 45-acre, 4.5-million-square-foot transit-oriented mixed-use development located in the heart of Greater Boston at the intersection of Cambridge, Somerville and Boston steps from life science and technology hotbed Kendall Square. Upon completion, Cambridge Crossing will feature 2.1 million square feet of state-of-the-art science and technology-geared office space, 2.4 million square feet of residential space with 2,400 residential units and 100,000 square feet of retail, presenting a strong headquarters and campus opportunity. The exterior facade of AVA North Point, a new six-story, wood framed, 265-unit luxury apartment community, has been completed. The complex, developed by AvalonBay Communities and built by Callahan Construction Managers, is set to open this summer. In addition to the façade completion, finishes are currently being installed within apartments that include granite countertops, stainless steel appliances, hard surface flooring and in-unit washers and dryers. Common spaces, including lounges, a fitness center, landscaped elevated courtyards and a swimming pool are also being fit out. Global healthcare technology leader Philips will move its’ North American headquarters to 243,000 square feet at 250 North Street, the first science and technology building at the 45-acre, 4.5-million-square-foot Cambridge Crossing development in East Cambridge. A total of 2,000 employees will work out of Philips’ new office, which will open in 2020. Philips' North American headquarters are currently located just north of Boston in Andover, MA. Philips is the first commercial tenant at Cambridge Crossing, which upon completion will feature 2.1 million square feet of state-of-the-art science and technology-geared office space, 2.4 million square feet of residential space with 2,400 residential units and 100,000 square feet of retail located minutes from Kendall Square. Just 170,000 square feet of science and technology space and 17,000 square feet of retail now remain for lease at 250 North Street, which is 57%-leased. DivcoWest has unveiled 101 Dawes Street, a nine-story, 635,372-square-foot office and laboratory building that would the next phase of the 45-acre, 4.5-million-square-foot Cambridge Crossing development. 101 Dawes Street would contain 375,000 square feet of core laboratory and office space, with 25,000 square feet of retail on the ground floor. Amenities would include large rooftop terraces on floors two and nine and on-site vehicle and bicycle parking. DivcoWest has filed plans for 101 Dawes Street with the City of Somerville, who is now reviewing the proposed project. Construction of 101 Dawes Street would take 28 months pending City approval. 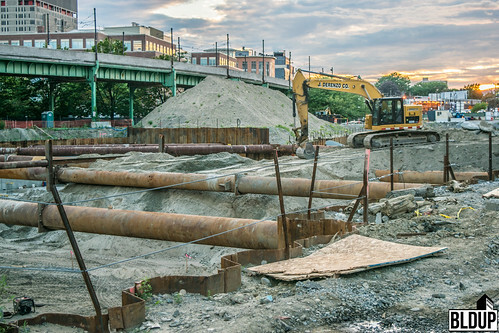 DivcoWest, who acquired the 45-acre NorthPoint development site in East Cambridge for $291 million in August 2015, has rechristened the project Cambridge Crossing. DivcoWest will construct 4.5 million square feet at Cambridge Crossing in the coming years with a mix of uses. The first buildings at Cambridge Crossing, a 430,000-square-foot science and technology building with ground-floor retail and retail structures totaling 15,000 square feet, are expected to be ready for occupancy in the second quarter of 2019; space is now available for lease. In total, Cambridge Crossing will feature 2.1 million square feet of state-of-the-art science and technology-geared office space, 2.4 million square feet of residential space with 2,400 residential units, 100,000 square feet of retail and over 11 acres of urban green space located steps from science and technology hotbed Kendall Square. The Boston Planning & Development Agency (BPDA) approved two new office and laboratory buildings totaling approximately 798,000 square feet at the 42-acre NorthPoint development site at last Thursday’s board meeting. The buildings, located on NorthPoint Parcels G and H, will be partially located in Boston; the vast majority of Parcels G and H is located in Cambridge, where the remainder of NorthPoint is located. The two buildings remain under review by the City of Cambridge’s Planning Board, and will require Cambridge approval in order to proceed with construction. Both a 14-story office and laboratory building containing approximately 450,773 square feet and a 15-story office and laboratory building containing approximately 347,600 square feet will be constructed on Parcels G and H, respectively. DivcoWest proposes to construct two new office and laboratory buildings at the 42-acre NorthPoint development site in East Cambridge. Two buildings totaling over 798,000 square feet would be constructed on NorthPoint Parcels G and H, adjacent to the Gilmore Bridge. On Parcel G would be a a 14-story office and laboratory building containing approximately 450,773 square feet; on Parcel H would be a 15-story office and laboratory building containing approximately 347,600 square feet of Gross Floor Area. Because portions of both parcels are located in Boston, the buildings will require approval from the Boston Planning & Development Agency (BPDA) in addition to the City of Cambridge. Plans have been filed with both cities, who are now reviewing the proposed project. DivcoWest proposes to construct two new retail buildings totaling nearly 15,000 square feet of space overlooking NorthPoint Common. The two-story buildings would be surrounded by public open space and outdoor seating, serving as an extension of NorthPoint Common. DivcoWest acquired 42 acres of land in East Cambridge’s NorthPoint district for $291 million in August 2015, including Parcel W, the parcel on which the retail buildings would be built. The City of Cambridge is currently reviewing the proposed project. DivcoWest has acquired 955 Massachusetts Avenue, a 95,000-square-foot Class A office building located in Cambridge’s Harvard Square, for $66 million in cash. The sale amounts to $694.74 per square foot. Seller Brickman purchased the building for $35.75 million, or $376.32 per square foot, in September 2007. Built in 2001, 955 Massachusetts Avenue is anchored by Mathematica Policy Research, who leases 62,000 square feet. DivcoWest’s acquisition follows the company’s recent acquisition of the 11-building, 644,771-square-foot One Kendall Square office and retail development in Cambridge for $725 million, or $1,124 per square foot, last November. DivcoWest also acquired 42 acres in Cambridge’s NorthPoint district for $291 million, or $6,298,571.43 per acre, in August 2015. DivcoWest has revealed renderings of a 370,000 square foot commercial building proposed for construction in Cambridge’s NorthPoint neighborhood. The proposed building, intended for lab and office uses, would overlook NorthPoint Common and would be the first NorthPoint commercial building. Completion of the proposed building, which is targeting LEED Gold efficiency certification, is expected in late 2019. DivcoWest filed a Design Review Application with the Cambridge Planning Board for the proposed building earlier this month. DivcoWest acquired NorthPoint, a 42-acre master-planned site, for $291 million in August 2015. J. Derenzo Companies has broken ground on Phase Two of the Avalon NorthPoint residential development project and is excavating the project’s foundation and underground parking structure. Two new buildings will be built as part of Avalon NorthPoint Phase Two containing approximately 285 residential units and 3,000 square feet of ground-floor retail. Driving of sheet piles is underway along the foundation to construct the sheet pile wall. The wall will reinforce Avalon NorthPoint Phase Two’s foundation and three-level underground parking structure. NorthPoint master developer DivcoWest acquired the 42-acre master-planned NorthPoint site for $300 million in August 2015. Upon completion, NorthPoint will contain a mix of residential and commercial uses located near Downtown Boston and Kendall Square. A new 355-unit residential apartment tower at NorthPoint, Twenty|20, opened in summer 2015. Avalon NorthPoint Phase Two is being developed in partnership with AvalonBay Communities and The McKinnon Company. AvalonBay Communities is building a 38-story mixed-use tower, Avalon North Station, across the Charles River from NorthPoint. 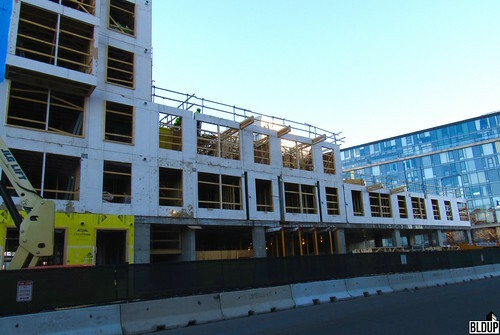 Avalon NorthPoint Phase Two is located across from both the existing Lechmere rapid transit station and the new relocated Lechmere station planned as part of the Green Line Extension project. More information about Avalon NorthPoint Phase Two is posted below.